World War II ended with the German atomic bombing of Washington, D. C. in early 1945. North America is occupied by the Third Reich from the Atlantic Ocean to the Rocky Mountains, and by the Japanese Empire from the Rockies to the Pacific Ocean. 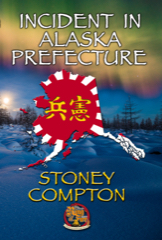 It is now 1967 and Alaska Territory is a military prefecture used for top secret research in the new "Quiet War" between the former Axis partners. The Japanese are building atomic weapons - and the Germans know it. Neither realizes the true strength of the Liberty Underground. There is about to be an Incident in Alaska Prefecture. Portions have been previously published in the Grantville Gazette.